RegionControl now also supports Windows CE OS. RegionControl was the last control of Bee Mobile iPack which did not run on Windows CE, but the latest improved version does run on Windows CE. 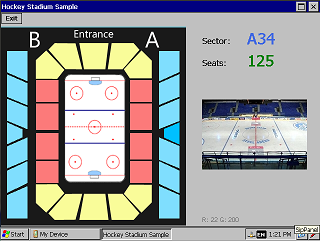 We also created a special sample project called Hockey Stadium Sample. Let’s say you are writing an application which allows the user to select a stadium sector in which he would like to reserve a seat. With RegionControl you can make this easily possible. The sample project also uses a TPictureBox to how a pre-view of the arena from the selected stadium sector. Windows Embedded CE (you can download a free evaluation from Microsoft web site here). Existing customers get the new version free of any charge within their product subscription. Non-customers need to download this free trial of Bee Mobile iPack to make the sample project run.